High Quality Content by WIKIPEDIA articles! 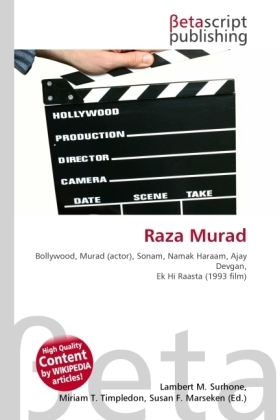 Raza Murad is an Indian actor working primarily in Hindi films. He has acted in over 200 Bollywood films. He is the son of renowned Bollywood character actor Murad. His niece Sonam was also an actress who is married to Director/Producer Rajiv Rai. Another niece Sanober Kabir has acted in a number of movies, and is a very popular stage performer. He has a son Ali Murad and a daughter Ayesha Murad who are also interested in becoming a part of the Bollywood fraternity. Raza Murad started his career in mid 60s and has mainly played either supporting roles of a father, uncle or villainous roles. He has a very rich and memorable baritone voice. One of his most memorable performances as a character actor has been the role of a despondent poet in the 1973 hit film, "Namak Haraam" alongside Amitab Bachchan and Rajesh Khanna.